Create magical moments by ordering online this Captivating Holiday Bounty Basket of Breakfast Goodies for your loved ones and spread your warm feelings into their hearts. 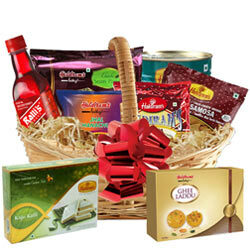 Make any occasion unforgettable with this Gift Hamper that features Haldiram Laddu (500 gm. ), Haldiram Mini Samosa (250 gm. ), Haldiram Chanachur (250 gm. ), Haldiram Bhujiya (250 gm. ), Ralli Singh Sharbat Rose (1 kg. ), Haldiram Gulab Jamun (1 kg. ), Haldiram Soan Papdi (1 kg.) and Haldiram Kaju Barfi (200 gm. ).